Why Did NASA, Lockheed Martin, and Others Spend Millions on This Quantum Computer? 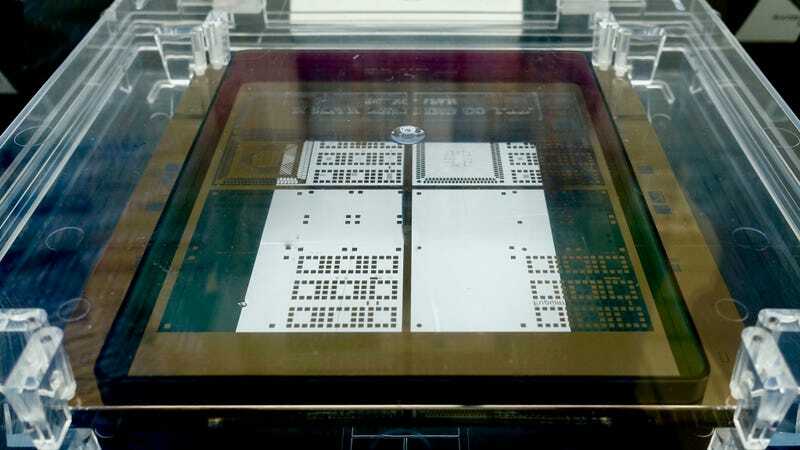 Lithography mask for a D-Wave quantum computer. Neither is true—mainstream uses for quantum computers are at least a few years to a decade away, and the big fear, that quantum algorithms will crack popular encryption strategies, is probably several decades away. Still, experts say we’ve entered a new era of quantum computing, and companies have begun putting out commercial products. IBM just recently announced a device catered to a commercial audience, and other companies like Google, Rigetti, and IonQ now or will soon offer access to cloud-based quantum processors. Meanwhile, NASA, Lockheed Martin, and Los Alamos National Lab have already purchased thousand-qubit quantum simulators for approximately $10 million to $15 million from a smaller, newer company we sometimes overlook, called D-Wave. You might wonder why people would buy such an expensive device when the technology in such an early stage. So why use bother with one of these devices? We posed that question to researchers using D-Wave computers at Lockheed Martin, Los Alamos National Lab, Volkswagen, and elsewhere. In short, D-Waves are in their early days, but these organizations are hoping to eventually use them to solve problems, like predicting elections, routing taxis in traffic jams, or picking crucial data out of background noise. They want to start approaching these puzzles from a quantum computing mindset as early as possible. No one yet claims to have found the killer app that will bring quantum computing power to the masses. And while D-Wave has demonstrated it can really simulate quantum mechanics, other machines can perform similar tasks, quicker. But if these researchers continue to refine their ideas, they’ll be ready for the day some future D-Wave machine, or any other quantum computer, might provide real benefits. Quantum computers, broadly, are computers that use “qubits,” or quantum bits, instead of regular bits, to do their calculations. Bits can either take on a value of zero or one, like a magnet that can either point north or south. Qubits must take on zero and one values when their calculations are complete, but during the calculation, they can take on values seemingly in between, interacting with other qubits via the mathematics of subatomic particles—each qubit is more like a series of flipping bar magnets. The algorithm determines the final value, which could be one or several combinations of those zeroes and ones. Some combinations of zeroes and ones are more likely, and others are forbidden, based on that quantum math. Most quantum tech companies such as Google, Rigetti, IBM, and IonQ—but not D-Wave—are pursuing gate model, “universal” quantum computers. This means that the qubits are set up in circuits as regular bits are, and receive instructions on how to interact with one another in the form of “gates,” individual quantum mechanical operations. D-Wave is instead a “quantum annealer,” more of a simulator than a computer. Imagine those flipping magnets again, represented in the D-Wave as loops of superconducting wire through which current can either travel clockwise or counterclockwise. Now the magnets are all flipping in an external electric and magnetic field. They’ll eventually all settle on some preferred, lowest-energy orientation. They’re useful for a small and specific subset of calculations. There’s a quantum aspect to it. If the combined magnets find an energy configuration that’s nearly the lowest possible, but for which some barrier prevents them from reaching the actual lowest state, a classical computer might stop the algorithm there. But in a quantum annealer, the qubits might still flip to the lowest-energy state. It’s called “quantum tunneling.” This is the equivalent of a marble in a jar on a table deciding that it would rather be on the floor, and is only possible in the quantum realm. The machine actually performs lots of flipping-and-measuring calculations per second, constantly refining things until it comes up with possible lowest-energy answers. D-Wave has built devices with 128, 512, 1,000, and now 2,048 qubits. They’re error-prone, and the qubits can pretty easily degrade into regular bits. There’s a lot of controversy surrounding them, mainly from folks who think that D-Wave is overselling its device—and these days, people aren’t nearly as impressed with the sheer number of the qubits as they are with their controllability, or whether they can remain quantum for a long time without degrading. The computers can only perform calculations that can translate into the flipping-in-a-magnetic-field example above. There is evidence but not incontrovertible proof that these computers can beat classical computers trying to solve similar problems. D-Wave’s qubits can very easily lose their quantum behavior due to interference from the outside environment. But even with those caveats, lots of companies and researchers have taken interest. Maria Spiropulu, a physicist at the Large Hadron Collider and CalTech, used Lockheed Martin’s D-Wave device kept at the University of Southern California in order to identify Higgs bosons in Large Hadron Collider data. She and her team even created a simulation of the D-Wave device that others can use to see if their problem is worth trying to solve on a real D-Wave. Dan O’Malley, a researcher at Los Alamos lab, uses the D-Wave to try and solve hydrology problems, such as predicting whether there’s sand or clay underground. Senior data scientist Max Henderson at the startup QxBranch used D-Wave to re-model the 2016 election. David Sahner, chief scientific officer of a startup called EigenMed, hopes he can provide better healthcare outcomes, using the D-Wave to predict what health problems one might have but not know about. Volkswagen researchers are trying to optimize automobile traffic, and have recently used the D-Wave computer to solve a chemistry problem, something folks are already doing on IBM gate-model quantum computers. These problems all have something in common: They contain lots of two-choice questions, like “diabetes or no,” “is the ground made of clay or sand,” “will this state vote Democrat or Republican,” or “is there a car on this road or not.” There’s an element of chance. Each of these two choices gets mapped to a qubit or set of qubits, and then the magnetic field is applied and D-Wave finds the most likely solution. There are classical methods that can solve similar problems, but these researchers are looking for ways to map their problems specifically on D-Wave’s architecture, in hopes of being prepared for the potential of a quantum computing revolution to come. And again, these are all proof-of-concept ideas. These researchers simply want to figure out whether D-Wave’s weird physics, probability-based qubits, and ability to solve optimization problems could actually be useful one day. And typically, these companies aren’t just using D-Wave devices, but are experimenting with quantum systems from IBM and other companies as well. Correction: This article previously stated that the Lockheed Martin D-Wave device was housed at California Institute of Technology, when in fact it’s housed at the University of Southern California. We regret the error. What the Hell Is a Quantum Computer and How Excited Should I Be? Google Unveils Largest Quantum Computer Yet, but So What?